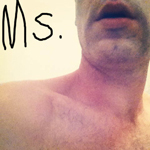 Ms. is Shane De Leon of Miss Massive Snowflake (& formerly of Rllrbll) making fun indie pop music on tour with friends. Ms has a strange sense of humor. Effects are thrown around for baffling and nothing more it would seem at first. Though it could be considered ‘rock’ on perhaps another planet, with the exception of one track it feels more electronic in origin. Guitars filter their way through on this tiny EP trying to give it a bit of coherence. Much of the EP focuses on spacey jams. Rhythm is an afterthought. Most of the EP feels quite spastic in nature. Pieces combust into tiny shards of sounds longing to come together. Thankfully Ms does not let that happen but focuses more heavily on the tension that comes with unstable sonic environments. ‘Sparklers’ is reminiscent of an early Warner Brothers band akin to ‘the rubber band’ rather than anything recognizable. ‘Samie Jith’ goes a bit closer to a song-like structure. Guitars strum around. Drum machines break into the mix attempting to bring the thing closer to a level of actual song craft. However song craft appears on the most accessible, poppy track ‘Tangled Up’. For ‘Tangled Up’ there is a decipherable beat, rhythm, melody and even vocals. Everything on here sounds of Elephant6 Collective style of silliness. ‘Hunter/Gatherer’ does have a discernible guitar riff. Sure there is something akin to vocals but it more of off the top of the head speaking heavily distorted. By the time of the finale the album has calmed down coming closer to ambience. It is the most elegant piece on the entire EP and a perfect ending to a strange trip.